It's been 78 years since Ann Hunt and Elizabeth Hamel were last together — in their mother's womb. The twin sisters were reunited last week for the first time since birth in Fullerton, California, thanks to a nudge from their children and help from a psychology professor, the Orange County Register reported Sunday. Hunt, who lives in England, was given up for adoption and only learned she had a twin when she began looking for her birth mother after her adopted mother died. Hamel, who lives in Oregon, always knew she had a twin but says she never thought she would see her. "How lovely to see you in the flesh," Hamel said, as she embraced her sister at a hotel in Fullerton. The women were to spend the next day undergoing testing at the Twin Studies Center at California State University, Fullerton, with professor Nancy Segal, who researches twins who were raised apart to better understand the role of genes and environment in human development. 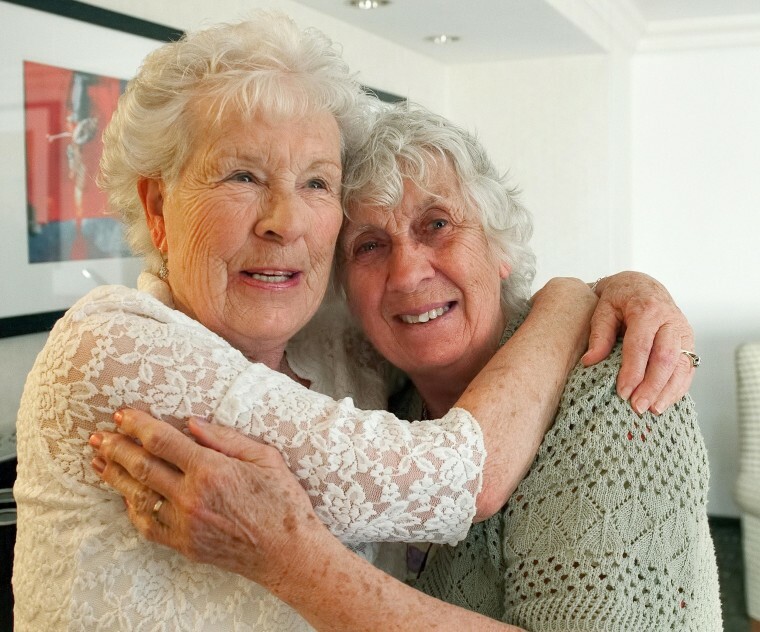 Both women were born in Aldershot, England, in 1936. Their mother, a domestic servant, decided to give up one of the girls after their birth father fled. Hamel said she kept her because she was born with curvature of the spine, which would have made it more difficult for her to be adopted. Hamel grew up an only child. She met her husband — a "Yank"— while stationed with the Women's Royal Enlisted Navy in Malta, and eventually moved to the United States. The couple had two sons. Hunt was adopted by a couple, and was also raised as an only child. She didn't look for her birth mother until after her adopted mother died, and only learned a year ago she was a twin. Samantha Stacey, one of Hunt's three daughters, tracked down Hamel and sent her a letter. The two women were soon talking on the phone. Hamel's son Quinton read one of Segal's books about twins and contacted the professor, who arranged the reunion. After undergoing testing in Fullerton, the sisters, who are believed to be fraternal twins, and cousins plan to spend a week at Hamel's home looking at old photos and learning more about each other. "You wonder about someone and what they're like and suddenly they're here," Hamel said. "It's a shock." "It's a shock and a joy," Hunt added.